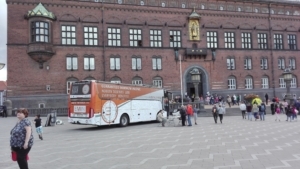 Today we were back on Raadhuspladsen, in front of City Hall from 10.00 to 12.00. It was a surprise when the representative of the Ministry in Spain, who is organising our September meeting in Madrid on the theme of Active Inclusion, called by the bus. It was a good reminder as we come to the end of our journey that our EMIN project is more than the bus journey. 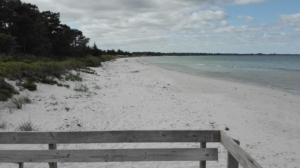 It was then time to leave Copenhagen and travel to our next destination, Saxildstrand, near Aarhus. It is a beautiful centre looking right onto a fabulous beech. It is owned by the city administration and manged by one of our Danish members and provides opportunities for accessible holidays for older people. 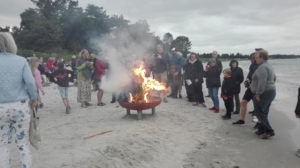 It was mid-summers evening, so we joined in the celebrations, with a small contained fire (bonfires were forbidden as it has been such a dry period) and singing on the beach. A group who are part of #ageplatformeurope (one of the members of EAPN) joined for the celebrations.